I’d never heard it before, but now I’m totally in love with it. 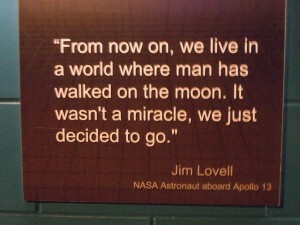 I think so many people take for granted that we went to the moon, especially my generation and the ones following. I was born 15 years after we landed on the moon, and 8 years after Star Wars came out. So by that time, adventures in space already felt somewhat commonplace. With all the CGI and special effects, all the fake outerspace, we’ve forgotten that we’ve really been there. We didn’t just make it up. We were there. People stared up at the stars for centuries, making up stories, monitoring time, imagining all the grand adventures that go on up there. And we went there, after centuries of mankind dreaming about it. The impact of that had been lost on me until today. I saw this really awesome movie about the Hubble telescope in the omnitheater a few months back, but in a way, these are things I’ve been seeing my whole life, either in text books or in summer blockbusters. I forgot how totally fricking insane is that we traveled thousands of miles in outer space, in an atmosphere we can’t even breathe, to a giant lifeless rock floating in the sky. Not only does it make everything I’ve ever done seem really inconsequential, it reminds me that everything is possible. We hold the power to shape our lives, our dreams, our worlds to be whatever we want them to be – no matter how far fetched they may seem. The point is we went to the moon because we decided to go there. We worked hard to make it a reality. If we can do that, then what’s stop us from doing anything else? The biggest obstacle between a man and his dream is himself. I don’t know. I just feel really re-energized and inspired by that. 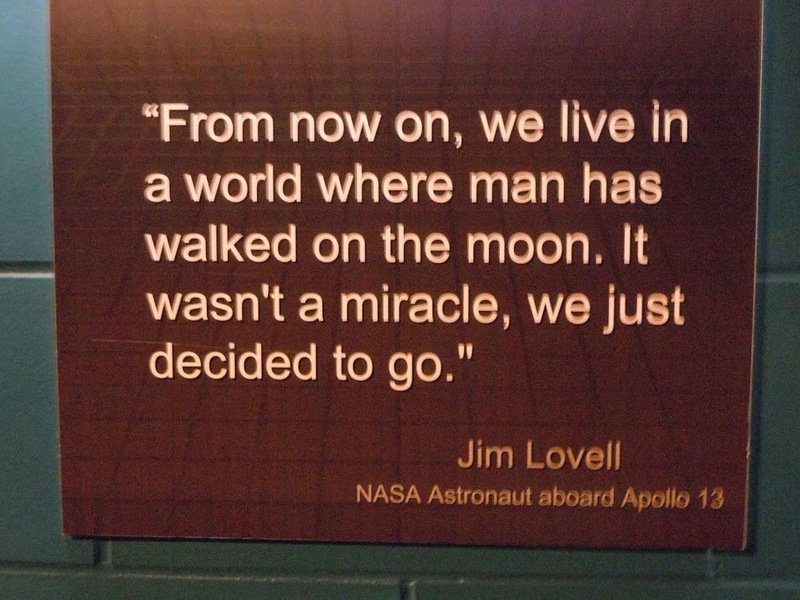 The simplicity and almost obviousness of Jim Lovell’s quote. “We just decided to go.” So I thought I’d shared it with you. A friend pointed this post out to me – as an ex-rocket scientist and engineer who worked for NASA, Jim Lovell is just a hero, plain and simple. You should watch Apollo 13 (the movie) if you haven’t already! p.s. I’m excited to be participating in the re-release of Switched tomorrow by hosting one of St. Martin’s book giveaways! Congrats on your re-launching! I’m not a huge space person but you should watch Ron Howard’s In the Shadow of the Moon. It’s fascinating! Amanda that was great! I totally feel you. You and I are from the same generation. I feel we take soo… much for granted period! Thank you for such an energizing start to my day. I haven’t read every post you’ve written, but the passion in this one sets it up there with the one about the musician who said “there is no silver bullet-just do it.” (I’m totally mis-quoting. That’s just the message I remember from the vid. Hmm. Should re-view.) Muchos gracias. Amanda, those of us who lived through the Cold War remember that the Apollo space program was championed by the Kennedy administration as an effort to keep the United States ahead of the Soviet Union in a new and important military theater: space. The moon was considered high ground, and if the Reds got there first the fear was they would be able to rain missiles down on the US with impunity. The remarkable thing about the Space Race is that it brought together the worst and best traits of humanity — the paranoia, fear, greed, and aggression, along with the ingenuity, persistence, and endurance — to achieve something no one thought possible: travel across empty space to another heavenly body, explore it, and come home again. How utterly human. How wonderful. And how I miss it! And spent billions of dollars doing it, too. Think about it. It is interesting to think that with so much that our generation has grown accustomed to, such a thing as going to the moon TODAY would be generic. But to remember this event in the awe-inspring way it’s meant to be remembered, this quote sums it up with mind blowing simplicity.